The Shazo Food Storage Containers are one of the highest rated brands we have featured here. They currently have a 4.3 star review on Amazon and only 8% of the total reviews are critical. However, of those 8%, there are a few things we will touch on. So are these really worth your money? Let's find out! The Shazo Food Storage Containers go the less expensive route with their materials. They use ABS and San plastic to create their containers, which definitely keeps the overall price of the product lower, but may also lower the quality of the containers. However, the plastic is very durable, so there is no need to worry in that department. The plastic is also 100% FDA approved BPA free, which definitely brings up the quality. Due to the plastic material, the storage containers are very lightweight and are easily stored. However, these are more meant for at home food storage, rather than on the go. While they are smaller than other at home storage containers we have seen, they are still bigger than ones that are made for being portable. Nevertheless, they should be able to handle whatever situation very well. The fact that the Shazo Food Storage Containers are made from plastic means that they have all the advantages of that material. One great advantage is being dish washer safe. This is a big leg up because being able to just toss these in your dishwasher, instead of having to hand wash them, saves a whole lot of time and energy. But, just to be safe, it is best to rinse them out before putting them in the dishwasher, as they do have some folds and crevices in the plastic mold that the washer may miss. The Shazo Food Storage Containers feature an airtight lid. This means that anything you put inside, if fresh, will stay fresh. This is great for vegetables, fruits, and even dry foods like pasta and beans. This is achieved by means of a snap-down plastic lid with an airtight seal inside. In addition, the lids also have a pretty innovative design. Instead of having to remove the lid completely to get to the contents, it features 2 openings. One pour lid, and a strainer lid that limits the amount that comes out. And that's always nice to have....for some reason. Since you get 20 of these boys, each will be one of the base 4 containers. Each of them has the same width and length but differ in height, which changes the overall capacity. So all of them have the same 3" by 6.5", but then you have a 8.4" tall container with a capacity of 2.1 quarts, 5.4" giving you 1.25 quarts, 4.2" with 1 quart, and a 2.8" with .5 quarts. Overall, good sizes and you'll get a total of 20 in each pack so I assume it will be the same amount of each type of container. I was not able to find a whole lot about this company unfortunately. Only that they are a seller on Amazon and are the only seller for these containers, if you buy them new. If you decide to buy them used, they will be sold by the Amazon Warehouse. The Shazo Food Storage Containers are made from FDA approved, BPA free plastic. This keeps the overall price low, but the quality still high. They are durable and easy to clean. Plus it helps that they are dishwasher safe. The build design makes for easy storing and does not require a whole lot of space. They are tall, rather than wide, which definitely saves space while keeping a decent inside capacity. These can also be stacked, which saves even more space. Shazo Food Storage Containers come with an airtight seal and innovative lid design. 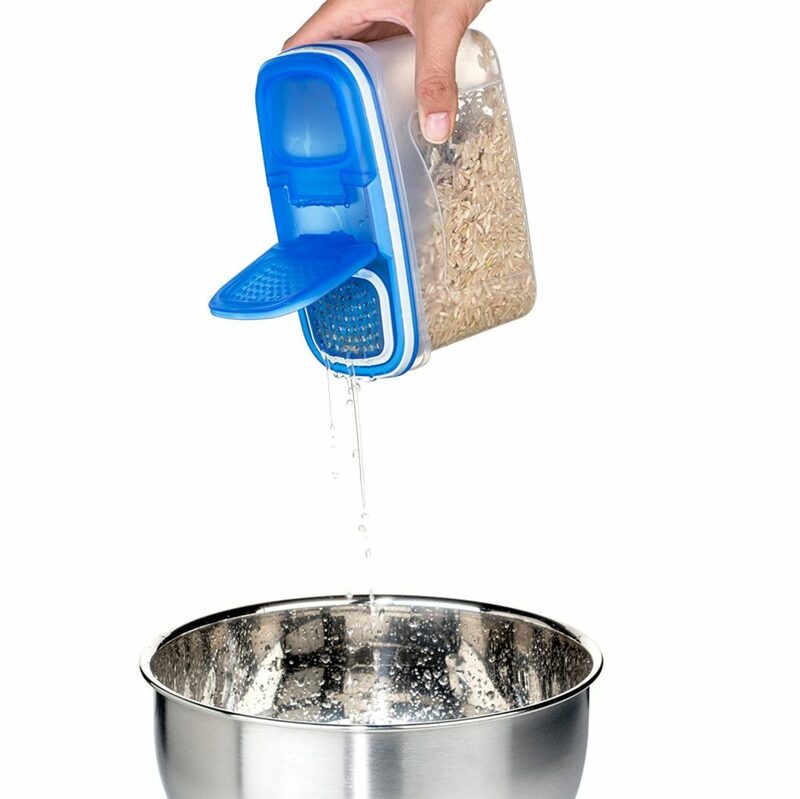 There are two utility lids that allow you to either totally pour the contents out or limit the amount that comes out by use of a strainer of sorts. This is nice as it does not require you to completely remove the lid to get to the contents inside. the utility lids are even large enough to insert a spoon or scoop. The markings on the side of the containers make for easy and quick measurements. Great to help you know what is inside and how much. While the plastic does keep the price low, some customers have said that the plastic feels a bit flimsy. This may be a non-issue as regardless if the plastic is flimsy, it will still hold up to whatever you put inside. However, the flimsy plastic may be an issue if you decide to stack these and one is rather heavier. The biggest complaint from people and the most common is that these are far smaller than they had thought. The pictures and even the measurements provided make these seem not large but still adequate. However many have said that these do not really fit a whole lot in them. It looks like they sacrifice decent capacity for space saving. One really cool thing that this company does is that they send you free chalkboard labels and liquid chalk markers for easy labeling of your containers. It may seem quirky, but it actually is a good idea, especially if you have a lot of containers in your kitchen. These labels could make things a bit easier, even more so if you are overly organized. Another thing is that the smaller size of the containers may be on purpose as they do send you a pack of 20 containers. This may be all part of their space saver gimick. Nevertheless, wouldn't it make more sense to send you a few big containers than 20 small ones? Just a thought. Overall, the Shazo Food Storage Containers look pretty good in terms of build quality, but they may be held back by the small size and pointless utility lids. There does not seem to be much need for the strainer lid. But if you want to try these out for yourself, you can grab a pack of 20 on Amazon for $34.99. For any other information, including the best food storage containers, check out the rest of Green and Growing. Here are some top questions that I found for people seriously considering buying the Shazo Food Storage Containers. Are these BPA free? Yes, they are. What are the heights of the canisters? The tallest is 8.4 inches, the shortest is 2.8 inches.